Many people (especially those reading this) enjoy cooking, but how exactly did you learn? Was it watching your grandma bake her famous apple pie or making homemade tacos with your dad as a kid? Was it YouTube videos that you watched when you were looking for a simple recipe to make? Surprisingly, not many people learn to cook at a young age, even though it is one of the most important life skills. I’ve been lucky enough to have several opportunities to teach kids how to cook, by running a program at my local elementary school, teaching a class at Whole Foods, cooking on my town news channel, and giving individual lessons to a little girl in my town (which is in the picture below.) These are just some of the tips I have found useful, and while I may not be an expert, I hope that they are useful for you too! 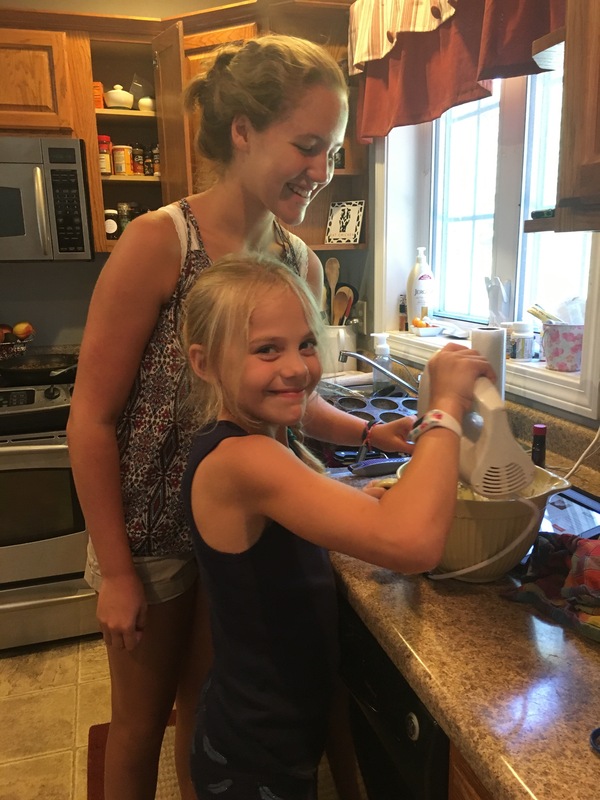 So, whether you’re a kid yourself who came across my blog, or someone who knows kids themselves or has their own, consider teaching them to cook! There is tasks for any age in the kitchen, and that way come college, kids will already know how to cook, and it won’t be another new skill for them to learn. Show that cooking is fun and not a chore! When something is seen as unenjoyable and more of a required activity than something that is fun to do, kids will be less apt to do it. So, show them that you are excited to cook and emphasize how much fun it is! Ask them about their favorite foods and ingredients, and use them to start. Often times when a kid’s favorite food is being cooked, they’ll be more willing to help and see how it’s made, because of the delicious outcome. Let them have their own tasks, and give them independence. If there’s one thing kids like, it’s being independent and in charge! Let the kids do something on their own, such as mixing in an ingredient, cracking eggs, or measuring an amount of something. They’ll feel more accomplished if they know they worked hard to make the dish. Emphasize the importance of reading a recipe and have them create their own! Giving kids the opportunity to create a one-of-a-kind dish on their own gives them a boost of creativity and lets them think outside of the box. Reading a recipe shows them the chronological steps of cooking and (as a bonus) helps kids who are learning to read! Share their recipe with others and make sure to give them feedback. Of course, it’s important to give first time cooks or young kids all positive feedback, but after they’ve had some experience, ask them what they think would make it even better the next time. This will get them excited to cook again! It is also great to have them show others what they made, and to make them feel proud of what they’ve cooked! « Razzy Peach Paradise Smoothie + Laney and Lu Cafe Collaboration!